This morning Mamarazzi had a pleasant surprise. Since installing FEEDJIT Live Traffic Feed, she can know where her readers are coming from. She noticed that one of the reader arrived from Pixart.com. She was rather surprised and puzzled. She track back the link http://www.pixart.com.my/blog/index.php/what-users-said/ . Pixart.com linked this blog to their website. Ohh...now Mamarazzi remembered. She did wrote in and praised Pixart for helping to make such a nice Coffee Table Photo Book for me. 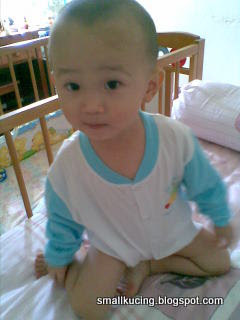 I still have it with me and whenever Papa not around, I would take the photo book and mumble " bababababa". Hmm...this FEEDJIT thingy is real useful ya. Sleepy Boy or Boring Book?